Our readers have enjoyed the personalized products we’ve mentioned here before, including personalized M&M’s, personalized greeting cards, personalized cartoon prints, and personalized U.S. postage stamps — to name just a few. Now, there’s another great personalized product available that makes a great gift for someone you love… Roses! How about a dozen personalized roses (fresh, ‘live’ ones!) — inscribed with your own customized message or embossed with a personal photo — for that someone special? 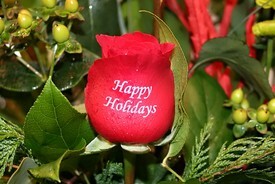 View pictures of personalized roses here. …Each individual rose comes with your own customized message embossed or inscribed on it! The custom rose packages at Speaking Roses are so personalized that you get to choose up to 4 lines of text (or go with one of their standard embossed messages). 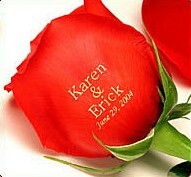 You can even have a personal photo or logo embossed onto a rose… or a dozen roses! Be prepared… just about every type of personalization comes with its own pricetag. But these personalized embossed ‘live’ roses are definitely worth it. Personalized roses from Speaking Roses and More make a VERY classy gift for that very special someone at that very special moment! Meet Blaine Harris, CEO of Speaking Roses. While you’re at it, why not send some chocolate covered strawberries along to sweeten the deal? Don’t miss this one-of-a-kind pet bed that’s shaped like a big red rose petal! The Inked Rose is another source of personalized, embossed roses.